The K&N E-4964 fits some Case , Gravely , Intl Harvester , Kohler , Kohler K181NL, Kohler K241-K321, Kohler M8, Tecumseh HH100, Tecumseh HH120, Tecumseh OH140, Toro Greensmaster 300, and Worthington models. See vehicle applications for details. 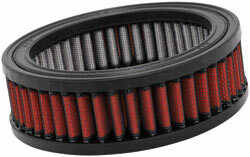 The K&N E-4964 replacement air filter is constructed using an oil-free synthetic media for superior filtration. This air filter can be washed and reused. The E-4964 is easy to install and is custom designed to fit right into the factory air box of some Worthington and Kohler engines, as well as other applications. Prefect fit, arrived in just a few days.